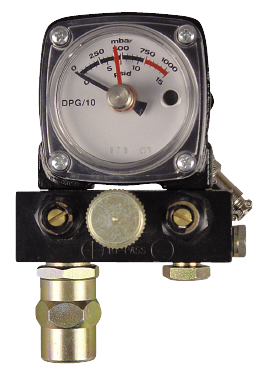 The differential pressure gauge type DPG is a measurement device for monitoring the pressure difference at filters, traps, etc. 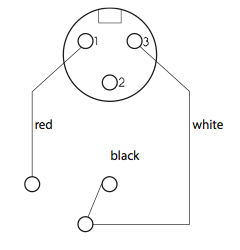 Differential pressure between entrance and exit is brought up onto a display by a diaphragm measuring system on a clock face. 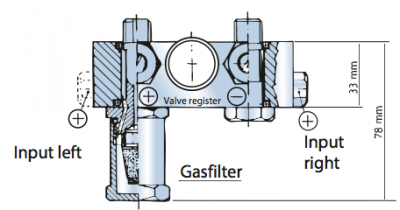 Contrary to the well-known rotary gas metering system, this system is not prone to construction-related leakages. 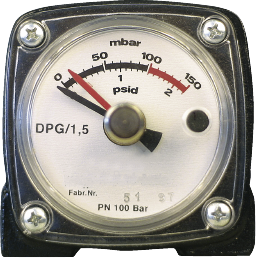 Model type DPG is 100% leak-proof and can be tested (static) with a measurement kit. There are 2 connections “G“ on the underside of the device (female thread) with the labeling (+) and (-). The plus connection (+) is connected with the measurement lead for the higher pressure and minus (-) with the measurement lead for the lower pressure. After the switch point has been set – recommended is the last third of the scale length – the magnet socket is secured with the fixing screw (Allen screw). register. The plus connection can be made either at the left or at the right. This avoids crossing of the measurement leads and the positioning of special versions of the basic unit. 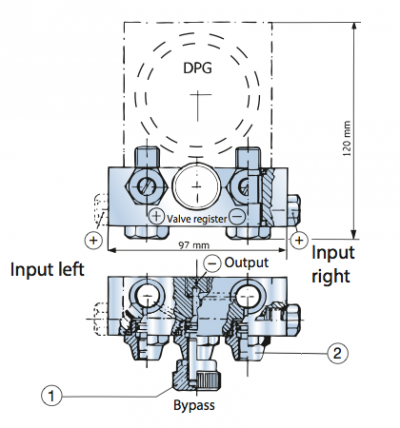 b) Pressure compatibility between (+) and (-) via knurled screw (1) in the middle of the valve register (e.g. run-up, for checking the 0 display during operation). c) Using both of the screws (2) O-ring sealed valves can be closed. 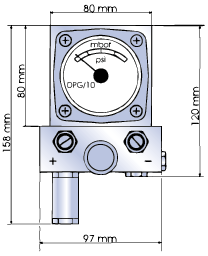 Differen- tial pressure gauge type DPG can then be removed problem-free from the valve register (e.g. for checking, exchanging, etc.). 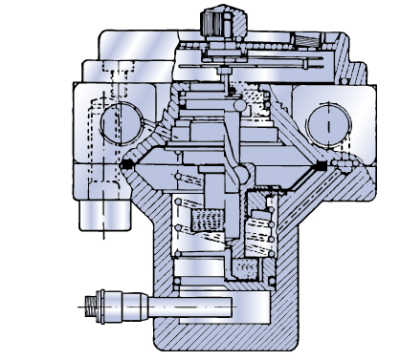 d) The valve register (manifold) contains both valves i.e. 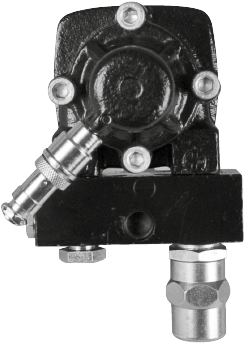 block ball-valves, which are otherwise necessary for mounting. e) Additionally, a filter cartridge can be screwed into the valve register (manifold) to protect the measurement mechanism. There are 3-pole reed contacts available, electrical capacity: 3 VA/28 V / 0.25 A. For operation in an ex-zone- electrical separation is necessary via approved ex-relay. Instead of screwing-in the valve block, a filter combination with sinter metal insert can be added. This filter combination prevents the penetration of contaminants into the measurement mechanism. A fixing bracket with the necessary spacer sleeves and bolts is available for stable fitting to a filter or a sign gantry.